G Suite from Google is a suite of cloud-based tools that give you the ability to function and communicate as a professional business. One example of how it can help your ‘Brand’ awareness is that it allows you to use your own domain, so emails come from @yourmassagebiz.com instead of @gmail.com. It includes all the powerful apps from Google that we have been using for years, such as, Google Calendar, Google Drive, Hangouts and many others. What makes G Suite different is that everything comes together under your business. 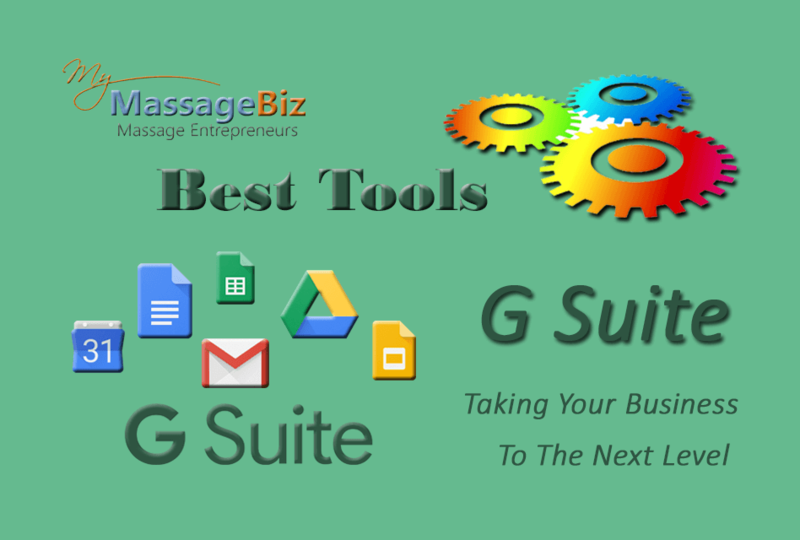 This is why I consider this installment of MyMassageBiz.com’s Best Massage Business Tools: G Suite to be essential for the success of your practice. Giving your business that professional look! For those who know me or have been following me for a while, you know how I put a lot of emphasis on the importance of professionalism as it relates to your overall chances of success. How your clients and potential customers perceive you can have an enormous affect on your ability to make a good living in this profession. Small things matter when it comes to how you are seen by your clients. Sending an email, returning a text, or providing an invoice are just some of the ways you interact with your customer. When your correspondence is professional, it takes your practice to another level that demonstrates to your clients how serious you are about your business. This builds their confidence, trust, and loyalty in your you and your brand. G Suite is the tool that helps you accomplish this goal. Why is it important to have G Suite? Use your business domain for your email. 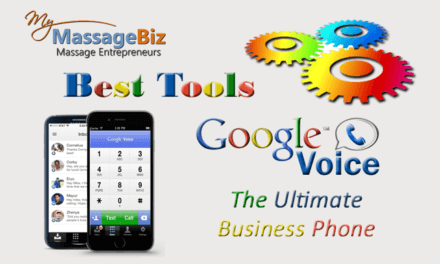 Connect your Google Voice business phone. Connect your Google+ business page. 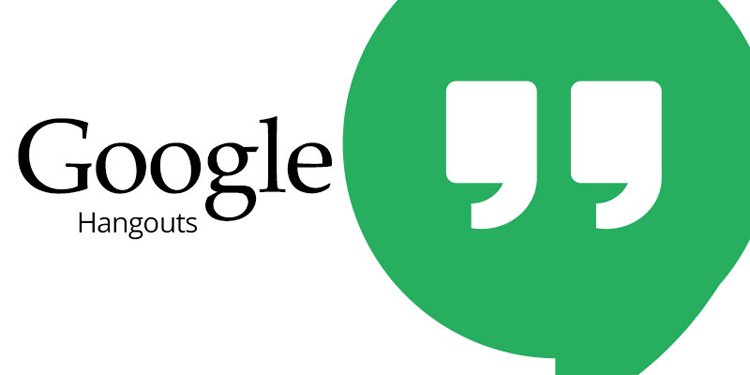 Use Google Hangouts to connect with your clients. Use Google Calendar to keep track of the important stuff. Use Google Docs, Sheets, Forms, and Slides. 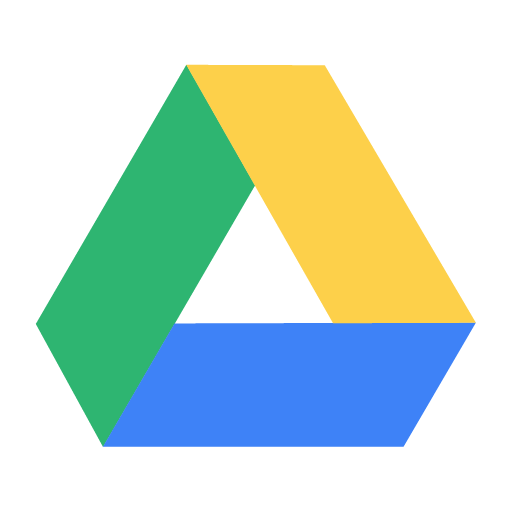 Everything you need, anytime, anywhere, with Google Drive. Set up multiple email aliases for Gmail. 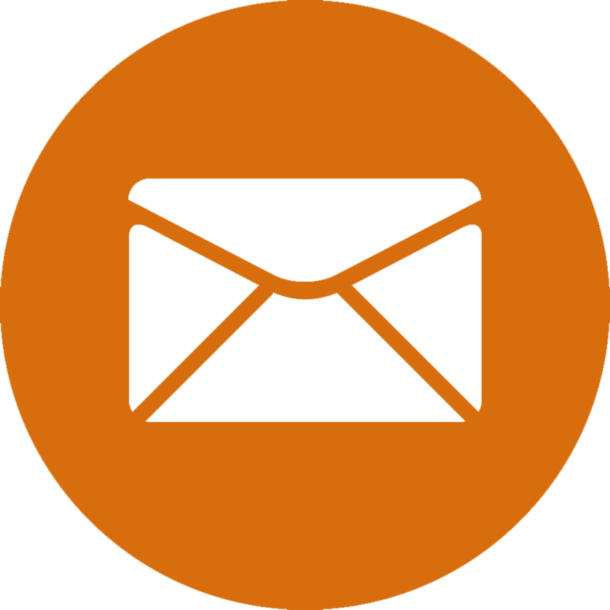 Build customer trust with a professional email address. Instead of using a generic email, G Suite lets you set up your domain, just like the big companies do. Your clients will see @yourmassagebiz.com in their inbox, thus adding to your brand awareness and professionalism. 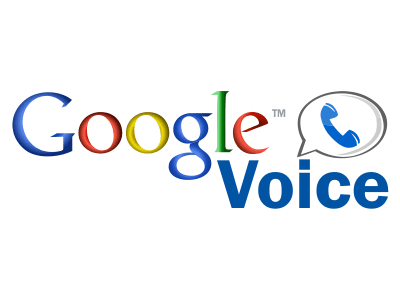 Google Voice is a free service that allows you to have a separate phone number for your business. There are many high powered features within Google Voice that can be extremely beneficial for running a successful massage practice. 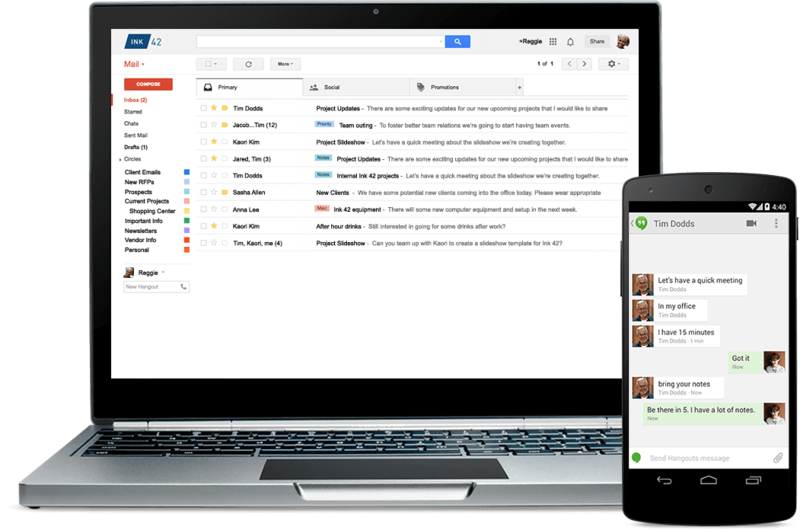 Connecting it to your business Gmail using G Suite allows you to receive emails notifying you of missed calls, voicemail converted to text, and the ability to return text messages right from your email. 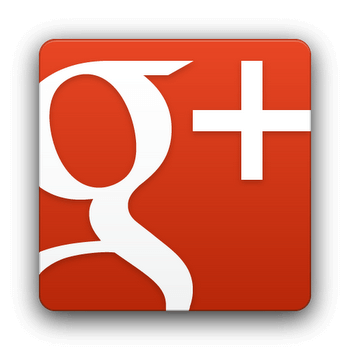 Google Plus, also known as Google+, gives you the ability to connect with a community of customers. Unlike other networks, Google Plus has significant impact on SEO and search traffic volume. Google Plus Pages for businesses are now managed through Google My Business, a platform that makes it easy for customers to find and connect with your business. Google My Business uses Search, Maps, and Google Plus to make your brand more visible in local search results. Connect with the people that make your business run via HD video, voice, or text. Hold a Hangout to demo a new massage specialty or make an announcement about your business. Your video conference streams live for free (up to 25 people) and is automatically saved to your YouTube channel. What a cool practice building idea! 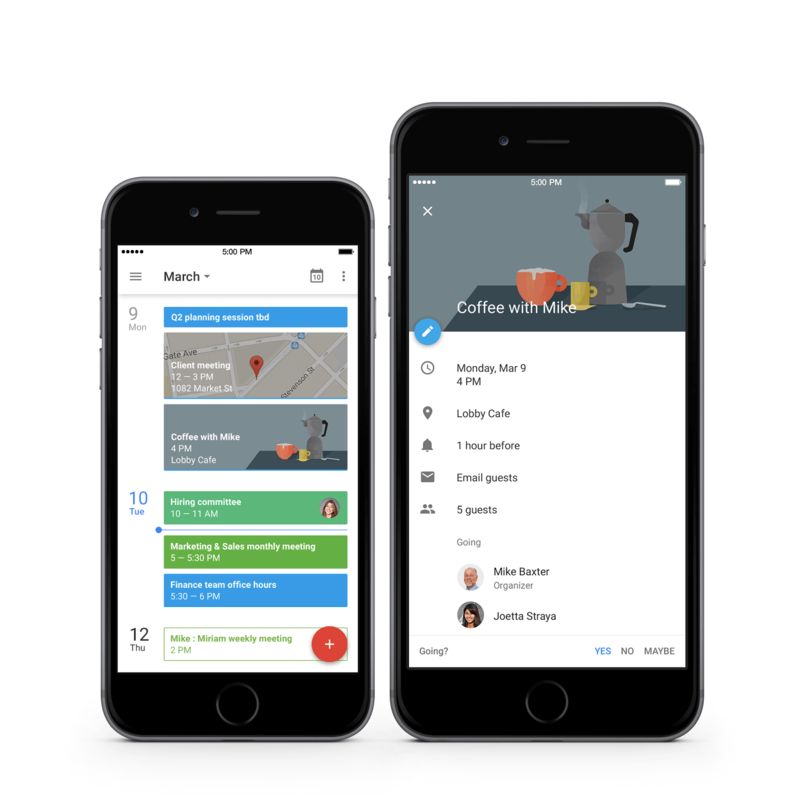 Spend less time planning and more time doing with shareable calendars that integrate seamlessly with Gmail, Drive, Contacts, Sites and Hangouts, so you always know what’s next. 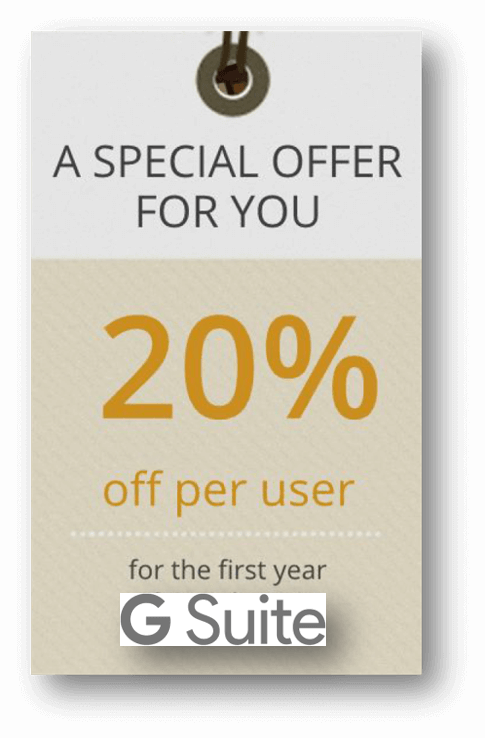 Share events with customers to let them know when something special is happening. 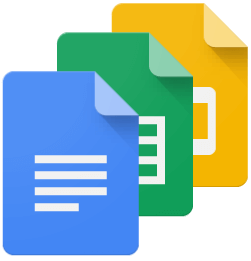 With Google Docs and Sheets you can create and edit text documents and spreadsheets right in your browser. Import your documents to make them instantly editable, including Microsoft® Word, Excel and PDF files. Produce, edit, and share from your phone, tablet, or computer, no matter where you happen to be. Create forms and send professional looking surveys to customers with Google Forms and if you’re ever asked to speak to a group, you can use Google Slides to create polished presentations in your browser. Keep all your work in one secure place with online file storage. Access your work whenever you need it, from your laptop, tablet, or phone. Everything is stored automatically. Have the peace of mind that you will never lose any important information again. One other cool thing, G Suite gives you 30GB of storage on Google Drive. One of the really cool things about G Suite is that it lets you set up multiple email aliases on your Gmail account. This gives you the ability to use a different email for different situations. If you want it to be personal, you could use your name, like mary@yourmassagebiz.com. A more generic email address could be info@ or support@. What makes it great is that once it is set up, all you do is choose the email address you want from a drop down menu in the composing window. It’s that simple. And when you get mail, it all comes into the same inbox, no matter what address they are sending it to. 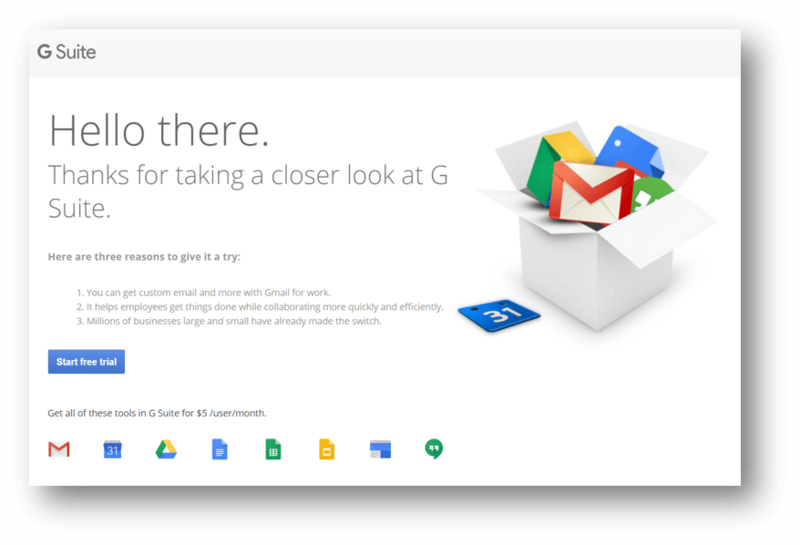 You can try G Suite for free for the first 30 days. After the trial period, it costs $5 per month. Sign up for your free trial at: http://mymassagebiz.com/GSuite. If you decide to continue your account after the free trial, you can use the MyMassageBiz.com coupon code: 7LRFVGTGUDUG9D and save an additional 20%. It’s not difficult to set up G Suite. Use the link above to sign up for your account, and then Google will walk you through the steps to get things going. Make sure you have your domain for your business before you start your G Suite sign up. If you need to get your domain, you can find out how by reading my article below or click here to go directly to Bluehost. G Suite (used to be called Google Apps for Work) has been another tool that I have used for many years and I can’t imagine running a business without it. The most powerful aspect of using this suite of apps is that it brings everything under your ‘Brand’ and allows you to communicate more professionally with your clients and prospective customers. 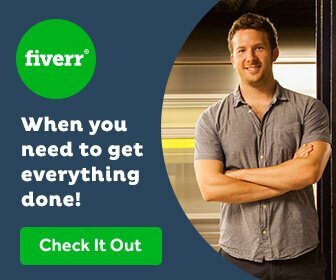 The $5 per month cost ($4 with my coupon code) is a reasonable investment considering what it does for you. Taking your business to the next level will increase your chances of success with an added professionalism and confidence perceived by your clients. I hope you found this article helpful. Please, leave a comment below and let me know what you think of G Suite. If you want to spread the word, please, share this article on Facebook and Twitter, or you can pin the image on the right to your Pinterest board. I wish you success and prosperity. Join our MMB community to get the latest information, articles, and tips to help you build your practice. 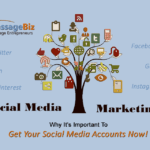 Dave created MyMassageBiz.com as a tool to help massage therapists start and grow their own successful businesses. He has worked in the field for over 25 years as a therapist and as the owner of multiple massage clinics. Are you doing everything you need to do to build a successful business? Check out my report and see! Some of the resources listed in this article may contain affiliate links. This means that if you choose to make a purchase, I will receive a small commission. This commission will come at no additional cost to you. 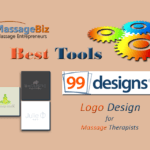 I have worked with these companies and they come highly recommended as helpful for your massage business. However, please do not spend your money on any of these products unless you feel they will be helpful to you. Thank you for your support.